A normal spine, when viewed from behind, appears straight. A spine affected by scoliosis has a sideways, S- or C-shaped curvature. The vertebrae (back bones) may also be rotated. This makes it look like the patient is leaning to one side, or has one shoulder higher than the other. A patient is diagnosed with scoliosis when the curvature measures 10 degrees or greater. 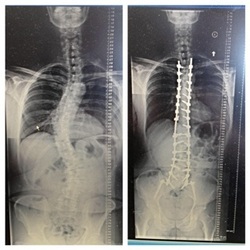 Scoliosis is not due to poor posture. Your spinal curvature may occur on the right, left or on both sides of your spine. Both your thoracic (mid) and lumbar (lower) spine may be affected. Find out how much you know about scoliosis by taking this quiz.